Producers: Steve Zeitlan/Elena Martinez/City Lore, Inc.
There’s a postage stamp of urban sidewalk known by people of a certain age for having burned to the ground. A more recent generation know it as the place where hip hop was born. An older generation remembers the time that this turf produced a hot New York Latin music sound that came to be known as salsa. From Mambo to Hip Hop: A Bronx Tale is an hour-long documentary that tells a story about the creative life of the South Bronx, beginning with the Puerto Rican migration to the neighborhoods in the 1940s and ‘50, and the adoption of Cuban rhythms by musicians who created the New York salsa sound. It goes on to tell of the fires of the ‘70s that destroyed the neighborhood but not the creative spirit of its people, and then chronicles the rise of hip hop from the ashes. The film closes with reflections on the power of the neighborhood’s music to ensure the survival of several generations of its residents, and, in the process, take the world’s pop culture by storm. From Mambo to Hip Hop features well known figures in salsa — Ray Barretto, Willie Colon, Eddie Palmieri, footage of Tito Puente and Machito, as well as key figures in hip hop including Afrika Bambaataa, Grandmaster Caz, and DJ Charlie Chase. Yet this is not a film about the stars but about a neighborhood, the South Bronx, a neighborhood that gave rise to and nurtured generations of artists (including the stars). The story captures an interplay of people, place, and music that produced internationally significant cultural movements in one of the world’s least likely places. 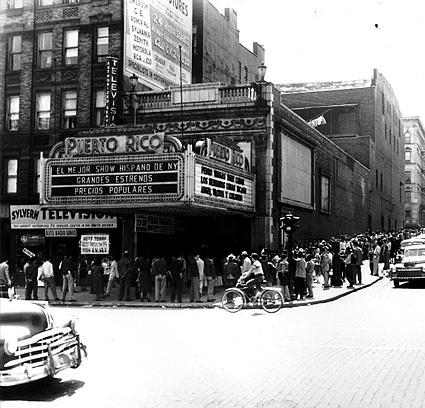 From the late 1940s through the 1960s the Melrose, Mott Haven, Longwood and Hunts Point areas of the South Bronx were, according to its residents, “a hotbed of Latin music.” Hundreds of Latino musicians grew up in or moved to this area from East Harlem or directly from Puerto Rico and Cuba. From the late 1950s to the early ‘70s, a deadly combination of factors – public and private disinvestment; official “urban renewal” and “planned shrinkage” policies; loss of small manufacturing to cheaper labor states; loss of live audiences to television; drugs and street gangs – had eroded the infrastructure and begun the decline of the South Bronx community. Ultimately, the result was what came to be known as “the burning of the Bronx.” But what stands out in this story is the resilience of this community and how music and dance–the thread that runs throughout its history–supported that resilience and helped the community rebuild. During the height of the destruction, Latino and Black teenagers, like the mambo and salsa musicians before them, held parties and jams in schools, basements, parks and playgrounds — even in the burnt out buildings that became their clubhouses. Tying their turntables, speakers and amps into lampposts for power, teens gathered to rap, break, spin and “scratch” records. A chronicle of both hip hop and salsa in the Bronx, the film shows how the mixing of African Americans and Latinos gave a crucial lift to the musical cultures of the South Bronx. Henry Chalfant studied at Stanford University, where he majored in classical Greek. Later he pursued a career as a sculptor, exhibiting his work in New York and Europe. He turned to photo and film documentation in order to do an in-depth study of hip-hop culture and graffiti art. Exhibits of his photos include the O.K. Harris Gallery and the landmark New York-New Wave show at P.S. l, and important galleries and museums in Europe. His images of graffiti on NYC trains were included in the Whitney’s exhibition, “An American Century.” His photos are in the collections of the Metropolitan Museum of Art in New York, and the Carnegie Institute in Pittsburgh. Through his company, Sleeping Dog Films, Henry co-produced and handled photo-documentation for the film, Style Wars, first shown on PBS in 1984. He is codirector of the newly released Style Wars DVD. He co-produced with Rita Fecher and directed the documentary on South Bronx gangs, Flyin’ Cut Sleeves (1993), and produced and directed music videos for the rap group, The Latin Empire: “Puerto Rican and Proud” for Atlantic Records and “Asi Es La Vida”, chosen as one of the ten best videos on International MTV in 1990. He recently completed The Carnegie Deli Presents, ‘What a Pickle!’ (1999), and is currently producing a documentary film, Grand Tour, based on film footage his father shot in 1931 while on a trip around the world. Henry co-authored the definitive account of New York graffiti art, Subway Art (Holt, 1984) and a sequel on the art form’s world-wide diffusion, Spray Can Art (Thames and Hudson, London, 1987). Born in 1940 in Sewickley, Pennsylvania, resident of New York City with his wife Kathleen, an actress. They have two children, David, a musician and producer, and Andromache, a set designer. Elena Martinez received an M.A. in Anthropology and an M.A. in Folklore at the University of Oregon. Elena’s Folklore Studies concentrates were in Latin American history and video production,. She was also interested in material culture and urban folklore, so after internships at the Smithsonian Institution’s Folklife Festival and City Lore, she took a full-time position at City Lore in 1997. As staff folklorist at City Lore: The New York Center for Urban Folk Culture (www.citylore.org), she is the primary fieldworker for Place Matters, and its sub-project, the South Bronx Latin Music Project, conducting interviews with musicians from the South Bronx, conducting photo and archival research, and producing public programs. She curated the exhibition, “¡Que bonta bandera! : The Puerto Rican Flag as Folk Art,” which has traveled through the tri-state area, and co-produced the exhibition, “A Float for All Seasons: New York City’s Ethnic Parades,” at the Museum of the City of New York. She is the Festival Coordinator for the People’s Poetry Gathering, a major 3-day festival which explores literary poetry’s roots in the oral tradition. As a student of Rosa Elena Egipciaco, a master in the art of mundillo, Puerto Rican bobbin lace and National Heritage Award winner, she has also worked with and organized programs pertaining to this craft. She is a contributor to Latinas in the United States: An Historical Encyclopedia by historians Virginia Sánchez Korrol and Vicki L. Ruíz, and she is on the Board of Directors for the New York State Folklore Society and the Middle Atlantic Folklife Association. Steve Zeitlin serves as Director of City Lore, and received his Ph.D. in folklore from the University of Pennsylvania, and an M.A. in literature from Bucknell University. He is the director and cofounder of City Lore, an organization dedicated to the preservation of New York City’s — and America’s – living cultural heritage. City Lore works closely with New York’s diverse communities to develop strategies for validating and disseminating their cultural heritages. He also codirects the People’s Poetry Gathering, a national poetry festival in New York City. Steve Zeitlin has served as a regular commentator for the nationally syndicated radio shows, Crossroads and Artbeat, and currently develops segments for The Next Big Thing, heard on public radio stations across the U.S. His commentaries have appeared on the Op Ed pages of the New York Times and Newsday. He also coproduces with NPR producer Dave Isay the storytelling series American Talkers for NPR’s Weekend Edition Sunday and Morning Edition. Prior to arriving in New York, Steve Zeitlin served for eight years as a folklorist at the Smithsonian Institution in Washington, D.C., and has taught at George Washington, American University, NYU, and Cooper Union. He is coauthor of a number of award winning books on America’s folk culture including A Celebration of American Family Folklore (Pantheon Books, 1982); The Grand Generation: Memory Mastery and Legacy (U. of Washington Press, l987); City Play (Rutgers University Press, l990); Because God Loves Stories: An Anthology of Jewish Storytelling (Simon & Schuster, 1997); and Giving a Voice to Sorrow: Personal Responses to Death and Mourning (Penguin-Putnam, 2001). He is the author of a volume of poetry, I Hear American Singing in the Rain (First Street Press, 2002). He has also coproduced a number of award winning film documentaries including How I Got Over; The Grand Generation; and Free Show Tonite on the traveling medicine shows of the l920s and 30s.